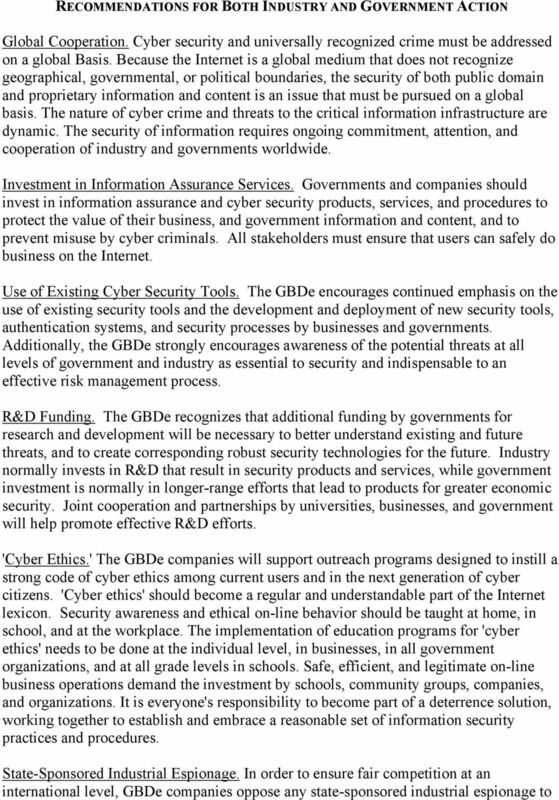 Download "GLOBAL BUSINESS DIALOGUE ON ELECTRONIC COMMERCE CYBER SECURITY AND CYBER CRIME SEPTEMBER 26, 2000. CEO EDS Corporation"
2 INTRODUCTION Through the use of information technology, innovative applications and global networks, companies are developing new business models to create, market, distribute, and sell products and services at ever-competitive prices. Thereby, consumers enjoy increased choice and lower prices. However, the open and interconnected nature of the Internet also involves risks and vulnerabilities. 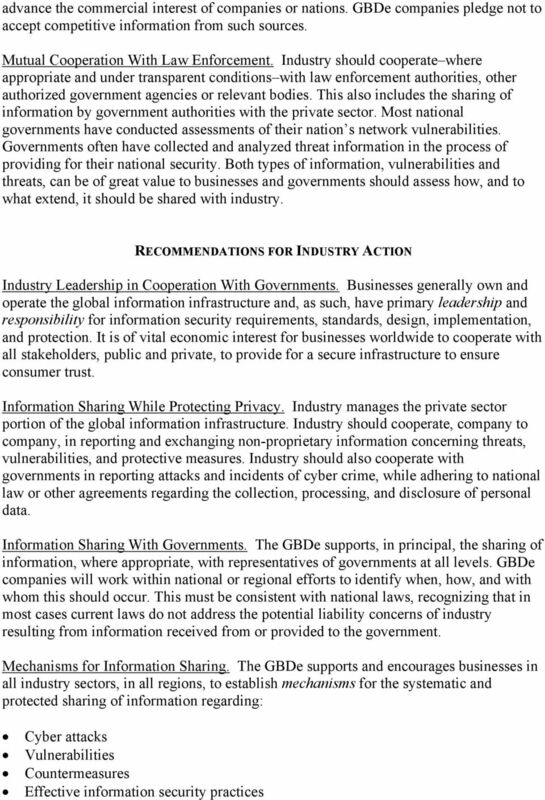 The industry sectors crucial to national and global economic stability and growth (such as telecommunications, financial services, transportation, energy, government services, and the information and communications industries) face increased threats and major economic damage when the underlying information infrastructure is targeted or made vulnerable by illegal activity. Problems caused by recent incidents such as denial of service attacks on e-commerce sites have highlighted the need for a more resilient and secure Internet. Therefore, cyber security has become a high priority issue on the political agenda at the national, regional, and international level and with businesses all over the world. Equally important as these well publicized cyber attacks are traditional crimes committed by means of the Internet, such as theft of proprietary information and content, fraud, money laundering, and identity theft. In this paper, both traditional and new forms of offences will be addressed. 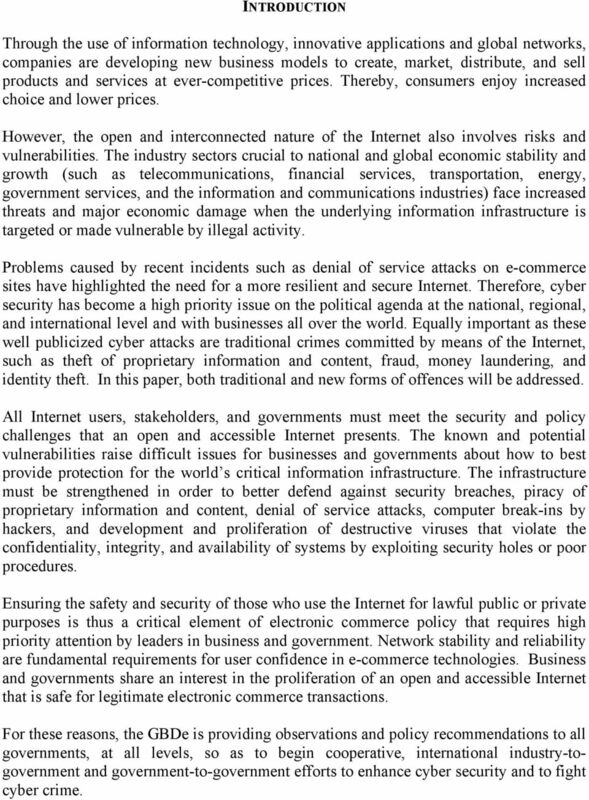 All Internet users, stakeholders, and governments must meet the security and policy challenges that an open and accessible Internet presents. The known and potential vulnerabilities raise difficult issues for businesses and governments about how to best provide protection for the world s critical information infrastructure. The infrastructure must be strengthened in order to better defend against security breaches, piracy of proprietary information and content, denial of service attacks, computer break-ins by hackers, and development and proliferation of destructive viruses that violate the confidentiality, integrity, and availability of systems by exploiting security holes or poor procedures. Ensuring the safety and security of those who use the Internet for lawful public or private purposes is thus a critical element of electronic commerce policy that requires high priority attention by leaders in business and government. Network stability and reliability are fundamental requirements for user confidence in e-commerce technologies. Business and governments share an interest in the proliferation of an open and accessible Internet that is safe for legitimate electronic commerce transactions. 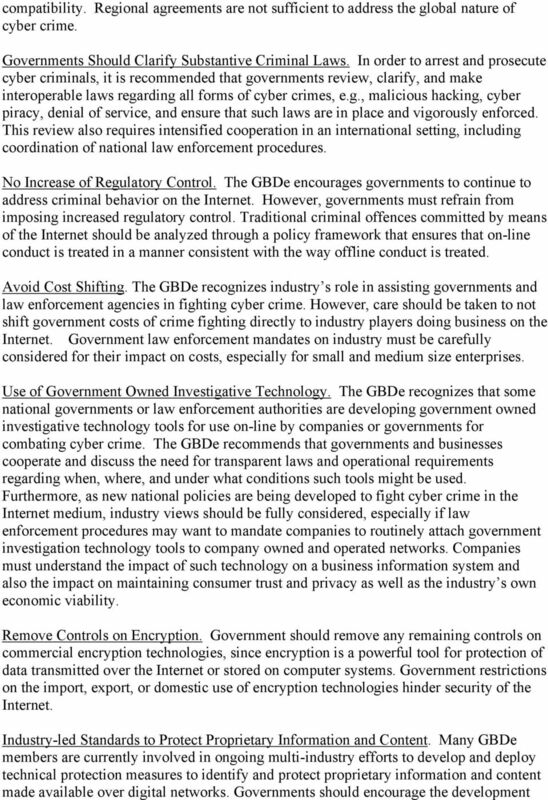 For these reasons, the GBDe is providing observations and policy recommendations to all governments, at all levels, so as to begin cooperative, international industry-togovernment and government-to-government efforts to enhance cyber security and to fight cyber crime. 7 and use of such industry-led measures and should refrain from mandating government requirements or standards in this area. Government-To-Government Coordination. 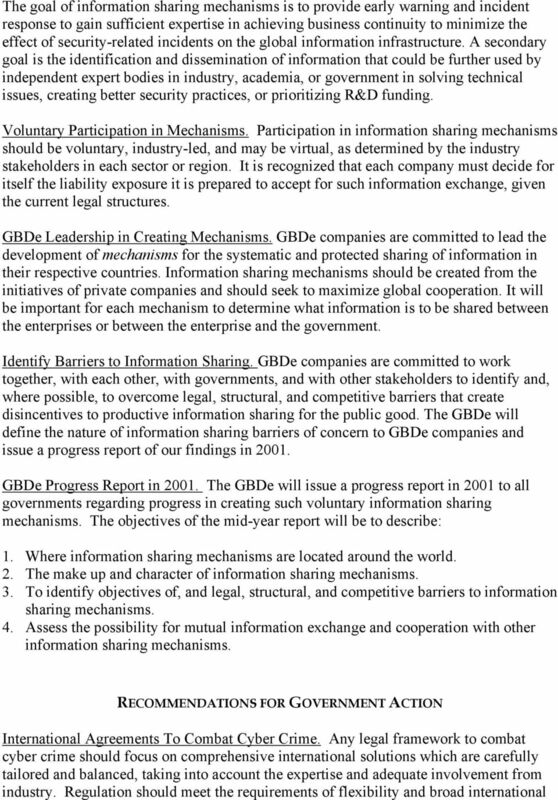 The GBDe strongly supports governmentto-government coordination and cooperation at the international level so that law enforcement investigative demands of one country would not violate the laws of another country. This problem is expected to become more acute as the Internet makes data storage more efficient and available globally. Shortage Of Skilled Workers. The GBDe recommends that national governments focus attention on the critical shortage of skilled workers that currently exist, especially in the information security area. The demand for security specialists will only increase as more companies are going to use digital global networks. Priority III: A National Cyberspace Security Awareness and Training Program Everyone who relies on part of cyberspace is encouraged to help secure the part of cyberspace that they can influence or control. Policy Statement. Employee privacy, data protection and human resources. Prepared by the Commission on E-Business, IT and Telecoms. I.